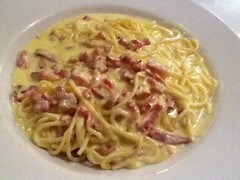 Photo of Spaghetti Carbonara by @topgold. I LISTEN TO Wholesome Ireland sharing ideas from her kitchen and my ears perk up whenever she shares tips on pasta. I hope everyone using our kitchen takes her cooking advice on board. For each 100g of pasta, you really need to use one litre of water and 7g of salt. I have sea salt directly to the left of our hob for this important task. I don't think you should put your pasta into the pot until the water is boiling. And you should put the salt into the pot after the water boils. I've watched sea salt causes spots on the bottom of pans when it sits in cold water prior to boiling. And don't put oil into the water. Never cool pasta in cold water. I think it's best to let the pasta cool down at room temperature. Pasta should be cooked al dente (with a little bite). This gives it a nicer texture and makes it easier to digest. We have sinners in our home who break spaghetti into thirds before it is cooked. That is a bad bad thing to do--even though the little ones want their spaghetti in four or five inch segments. I always add pasta into sauce instead of the other way around. I toss it in a skillet and that seems to cause the pasta to absorb the sauce. In 2014, I plan to experiment with different ways of making Carbonara sauce. It's the favourite sauce for both myself and my son. And here's a special twist--I plan to ask my budget-conscious college students how they make their euros stretch with frequent feedings of pasta.